Our new Russian samovar (literally translated: self-boiler) for the tea bar. We have mostly modern equipment in the tea bar and at home. The Zojirushi water heater does a fabulous job of bringing water up to temperature and holding it there, with multiple selectable temperature ranges and thermostat. But I’ve always loved traditional equipment, and I’m fascinated by the ways different parts of the world prepare their tea. I just purchased a Russian samovar (see picture) made in 1980. 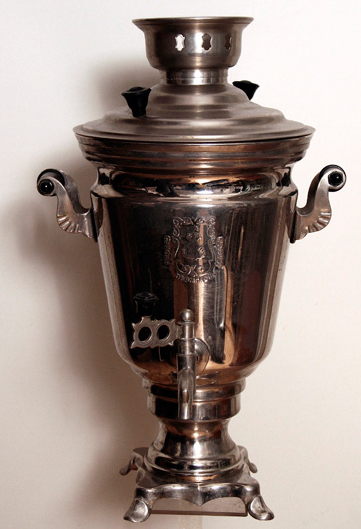 Traditional metal samovars in Russia date back to the early 1700s, when they used charcoal or other fuels to heat the water. A “chimney” ran vertically through the middle of the samovar, where the fuel generated the heat. The vessel was filled with water that would be drawn from a tap on the bottom. Often, a teapot was placed directly on top, so there would be concentrated prepared tea in addition to the heated water surrounding the chimney. One of the things I’ve always loved about samovars is their steampunk look. They metal is often beautifully worked and etched or engraved. My new one is made of brass plated with silver/nickel. The samovar is designed for a communal tea setting, where it is kept going all day long, and the condensed tea in the pot is diluted by the boiling water in the main chamber every time someone wants a cup. My new samovar is about 18 inches tall, and powered by good old-fashioned electricity. Since Russian AC power is 220 volt, I’m going to need to make or buy an adapter to let me run it on 110 volt U.S. power, but that’s pretty easy. Given its size and weight, I think I’ll find it a spot to live at the tea bar instead of trying to take it with me wherever I go. I think this will be a great way to enjoy some of the Russian Caravan tea that I like to drink in the afternoons. Or maybe I’ll get cross-cultural and use it for some Mr. Excellent’s Post-Apocalyptic Earl Grey. No need to be a tea Nazi, right? Posted on 8 February 2012, in Tea Biz, Tea Thoughts and tagged boiling, Russia, Russian Caravan, samovar, steampunk, Zojirushi. Bookmark the permalink. 2 Comments. If it’s in good shape and has the coffee pot that fits on top, it should be worth at least $75 to $100.